The gently rolling hills, lush forests, and sparkling waters disguise a land that has endured the effects of continental glaciers and massive mineral extraction. Each year, more than one million boaters, hikers, bikers, and swimmers visit the 16,725-acre park, yet never realize that many people helped restore the park from prior coal mining and oil and gas drilling practices. Today, the park is an outstanding example of environmental engineering achievement. The park is open daily from sunrise to sunset, unless otherwise posted. Park information, launch permits, cabin information, and assistance can be obtained at the park office near the entrance to the South Shore. The park office is open year round, Monday through Friday, from 8:00 A.M. to 4:00 P.M., and weekends during the summer. The Davis Hollow Marina office on the North Shore provides marina applications, launch permits, and general park information. It is open from April 15 to October 30. 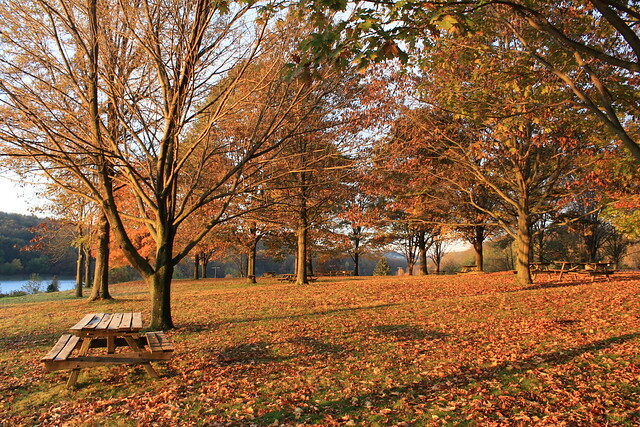 Make online reservations or call toll-free 888-PA-PARKS (888-727-2757 ), from 7:00 A.M. to 5:00 P.M., Monday to Saturday. Moraine State Park is in northwestern Pennsylvania near the crossroads of I–79 and I–80. It is bisected by PA 422 running east/west and PA 528 running north/south. To access the South Shore Recreation Area, take the South Shore Exit off PA 422. To access the North Shore from PA 422 west, take the North Shore Exit. There is no access to the North Shore from PA 422 headed east from I–79, so take the South Shore Exit, get onto PA 422 West and take the North Shore Exit. Bike the paved, seven-mile trail from the Bicycle Rental to the Davis Hollow Marina. Spend the night in a lakefront cabin. Take the Trail of Geology driving tour and climb to the top of the Jacksville Esker Glacial Deposit just north of the park. Rent a pontoon boat, kayak, or canoe and explore the 3,225-acre lake. Try your hand at the challenging 18-hole disc golf course. Visit the waterfowl observation deck for a chance to see ducks, loons, bald eagles, osprey, and great blue herons. Hike the Glacier Ridge Trail for spectacular scenic overlooks. Have a picnic with a view at the Lakeside Picnic Area in the South Shore. Charter a cruise on Moraine Preservation Fund's Nautical Nature enclosed pontoon boat. Glide along the Sunken Garden Trail on cross-country skis when the snow falls. The Lakeview Beach Concession is at Lakeview Beach on the North Shore, about five miles from PA 422. The second snack shop is at Pleasant Valley Beach along Pleasant Valley Road on the South Shore, about one mile from PA 422 and 1/2 mile from the park office. The concessions serve a variety of hot and cold fast foods including beverages and deserts. Food is available daily -- Memorial Day through Labor Day -- from 11:00 A.M. to 7:00 P.M.
Moraine State Park offers a wide variety of environmental education, interpretive, and recreational programs. Through hands-on educational activities, guided walks, and evening programs, participants gain appreciation, understanding, and a sense of stewardship toward natural and cultural resources. Teacher workshops and educational programs for students are available. Programs are offered year round. Please contact the park office for more information. Pontoon boat tours of the lake board at McDanels Boat Launch. These tours are provided through the Moraine Preservation Fund. Programs focus on the wildlife of Moraine and the development of Lake Arthur. The pontoon boat operates on a regular schedule throughout the summer. The pontoon boat is open to the public and is also available for charters for a fee.